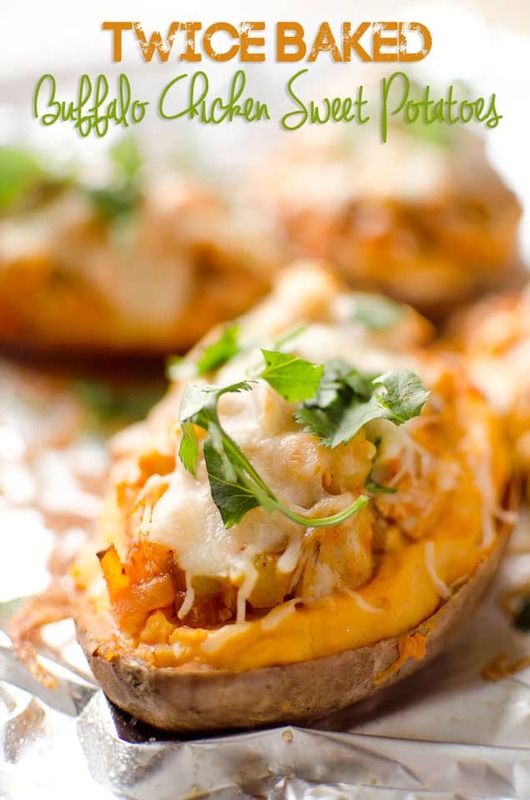 Twice Baked Buffalo Chicken Sweet Potatoes are an easy and delicious dinner recipe loaded with creamy bleu cheese whipped sweet potatoes and topped with buffalo chicken, veggies and reduced fat cheese for a complete meal loaded with bold flavor. 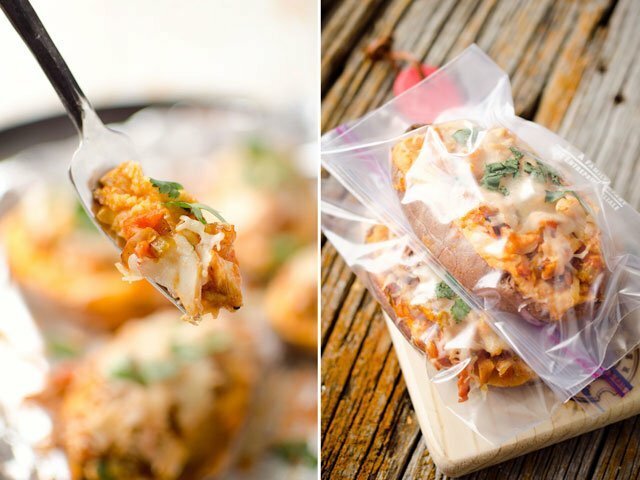 These make a great packed lunch or freezer meal for those lazy weeknight dinners when you want to enjoy a healthy meal. Just pack one portion into a resealable bag and toss them in the fridge or freezer. If you are looking for a meatless meal, you could easily skip the chicken and add some black beans and more veggies for a wonderfully satisfying vegetarian meal. Now that I am getting settled in to our new house, I am trying to transform some of my bad habits. The main one being my messy, cluttered, disorganized house! My old house was much smaller with very little storage space. That resulted in piles of stuff everywhere. It wasn’t as big of a deal to me with my old kitchen harvest gold laminate counters, but my new quartz counters are just too beautiful to have covered in junk! I have started trying to change my habits, and every time I cook something I put everything back in its place before eating. If I walk in the house, I put my shoes and jacket in the closet and unpack and put away any bags I bring in. It just feels so darn good to come home to a clean and organized house. My main concern is that this will be like every other time I have tried to change my old habits. It lasts for about a week or two and then it all goes back to the same old routine. I distinctly remember myself in college, telling myself at the start of every.single.semester, that THIS semester I would get my act together and go to all the classes, do all my homework, etc. etc. etc. Well, as you can guess, that lasted for a whopping week if I was lucky. Here is to hoping that this time I can make the change I want! I am very determined and have no excuses with this new house, because I have space and storage galore. Please wish me luck….I will need it! 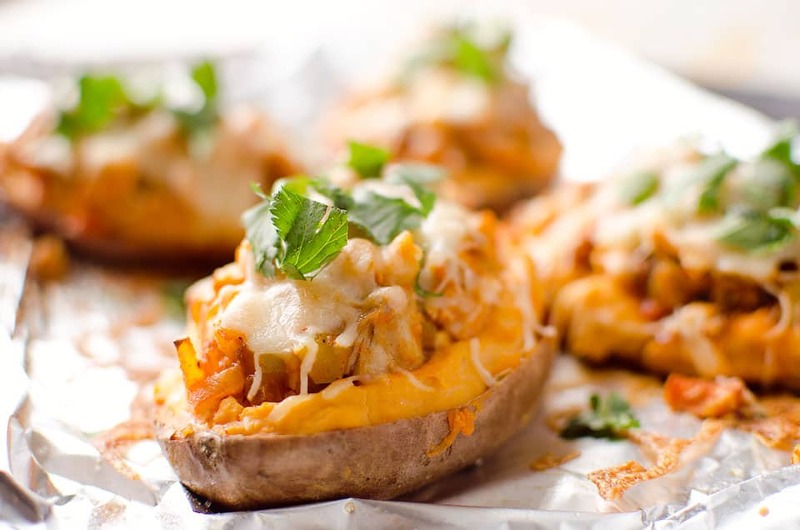 Twice Baked Buffalo Chicken Sweet Potatoes - An easy and delicious dinner recipe that also makes a great freezer meal for those lazy weeknight dinners when you still want a healthy meal! 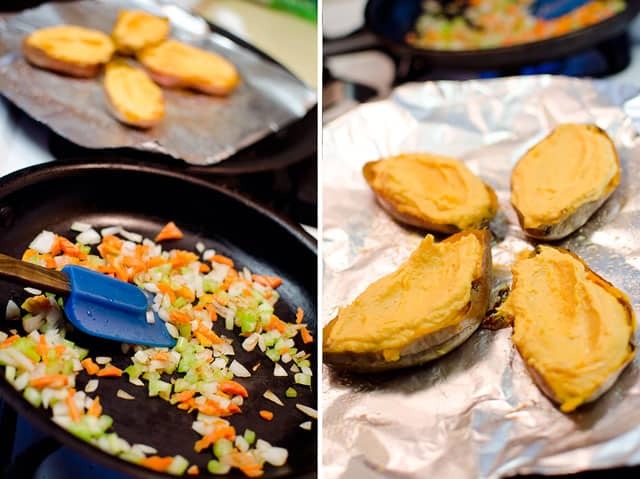 Poke sweet potatoes in a few spots with a small knife. Bake at 400 for 45 minutes or until soft. Remove the potatoes from the oven and allow to cool until you can handle them. Meanwhile in a skillet over medium heat, saute the carrots, celery and onions for 8-10 minutes. Add the chicken to the pan and toss with buffalo sauce so everything is well coated. Set aside. Slice the potatoes in half lengthwise and scoop out the flesh, leaving 1/4" remaining around the edges so they hold their shape. 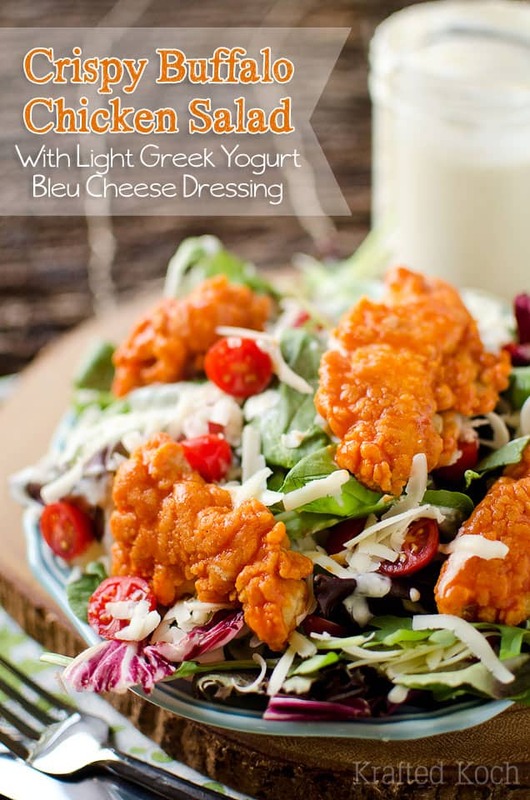 In a food processor blend the sweet potato flesh, Greek yogurt and bleu cheese until smooth. 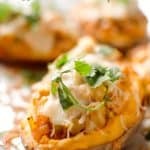 Fill the potato skins with whipped bleu cheese mixture and using the back of a spoon, create a small divot in the center. Evenly divide the chicken and vegetable mixture among the four halves, filling the divots. Top the halves with a tablespoon of shredded cheese and return to oven. Bake for 10-15 minutes or until the cheese is melted and potatoes are warmed through. Serve immediately. I’m currently attempting to make these, and I have to say so far I’m sorely disappointed. After over an hour in the oven, my potatoes are still rock-hard. I’ve just kicked the temperature up and put them in, sliced, for another 20 minutes so we at least have a chance at eating tonight. Will not be trying this one again. Sorry to hear your potatoes are taking so long. Perhaps they are very large? I’d love to hear what you think of the actual recipe when it’s finished! If you’ve had sweet potatoes in your oven for an hour at 400F and they are still hard….the problem lies with the oven and not the recipe. Sweet potatoes should definitely not take more than an hour to cook, unless they are huge football size sweet potatoes. 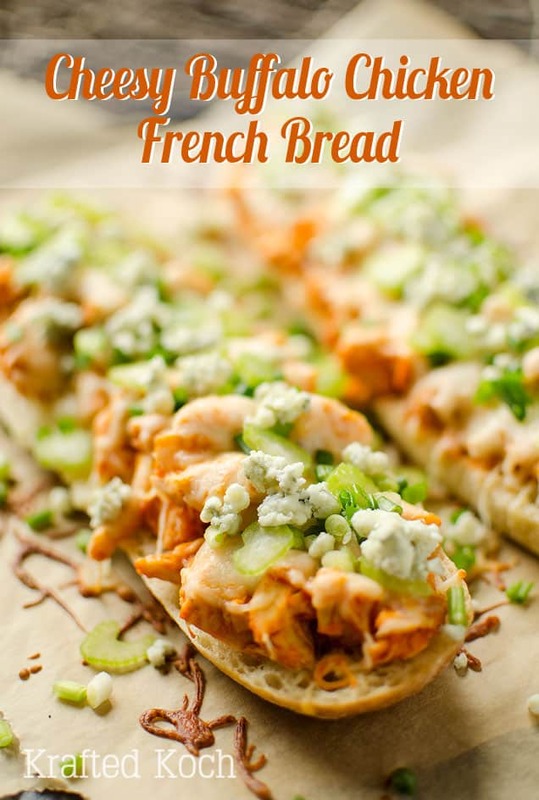 I think this recipe looks great – pinning for later! Happy to hear your family loved them! Hey Shelby, you are correct. They are frozen fully cooked, so they just need to be reheated. 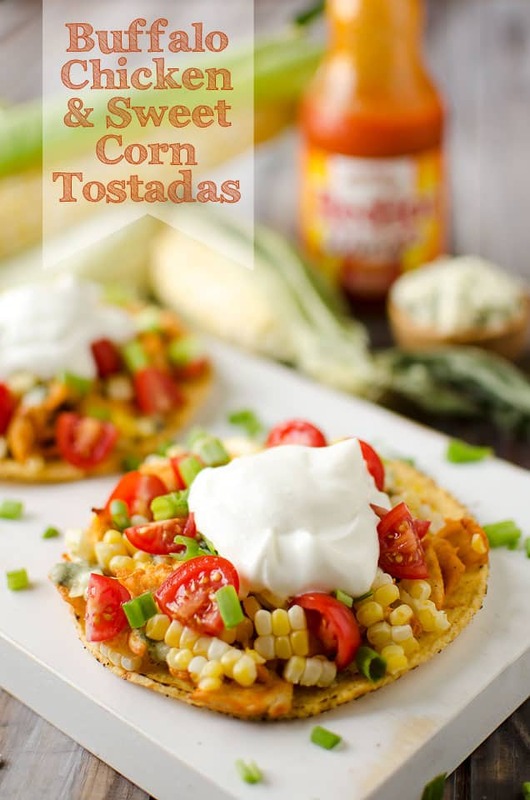 They are perfect for last minute dinners! Hi Anna, I actually bought cubed rotisserie chicken from my local grocery store, but you could saute or bake it. I baked these up on Sunday (weekly meal prep day) and I have to say….. THESE ARE AMAZING! I added some yellow and red bell pepper to the veggie mix and threw some green onion on top. Delicious! I didn’t have bleu cheese so I added in a little goat cheese, which worked out great. I will definitely be making these over and over! 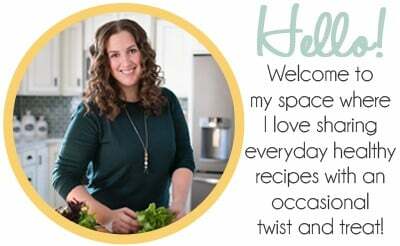 So happy to hear you added more veggies and loved them Kris! The goat cheese sounds like it would be an amazing sub for bleu cheese. How long can they stay in the freezer and how do you recommend reheating them? Thank you! I think they would store well up to 3 months. For reheating, it depends on how much time I have. If I am in a pinch, I will just microwave them. Ideally I pop them back in the oven to reheat though. Trying this tonight! And we are planning a move soon, from a long string of rentals with not much storage, into the dream house. I’m trying to change the same habits, and I always had the same conversations with myself in college. I’m terrified! How are your habits going?? I am shocked to say that I have actually kept my cleaner habits in my new house! 🙂 HAHA! Having a larger house with a place to put everything as well as it being so nice, I just can’t let it get really messy. That isn’t to say that I don’t have weeks were things start to pile up on the counter, but I usually nip it in the bud and don’t let it last more than a few days. I hope you are able to make the changes you want too!!! Just to double check it says after cooking the veggies add the chicken and toss with sauce. Is the chicken supposed to cook fully then you toss the sauce or you add chicken toss with sauce (so chicken is raw). If the chicken is to be cooked it should say add chicken and cook until chicken is done then toss in sauce. If you notice in the ingredient list, it calls for ‘1 c. chicken, cooked and cubed’, so the chicken is already cooked. I have quite a bit of left over potato/blue cheese mixture left. Any ideas for what I can do with it so it doesn’t go to waste? This happens with twice baked potatoes if you don’t really pile up the mixture in the skins. To use up the leftovers, you could spread it out in an 8″x8″ pan, topped with a little shredded cheese and bake it until it is heated through. It would be great served as a side dish with grilled chicken or steak. 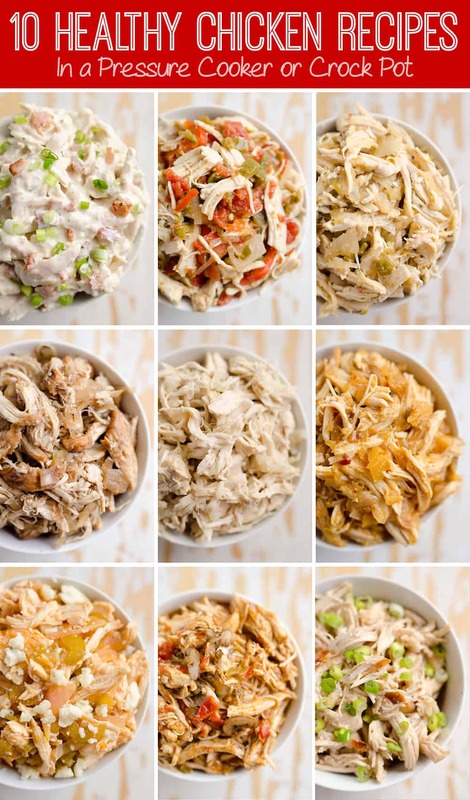 When you freeze these and reheat in the oven, how long do you reheat and at what temperature? Thanks! If they are thawed, I will pop them in the oven at 350 for 15-20 minutes to heat them through. That sounds like a perfect way to use up the extra chicken! I haven’t, but I think they would be fantastic for those who don’t like sweet potatoes! You can freeze them after they have been fully cooked and cooled. They can be reheated in the oven or microwave, preferably thawed so they heat through evenly.